Bird’s nests is so crunchy and just the right sweetness. This Bite sized nutty dessert is popular Middle Easter dessert specially during the holy month of Ramadan and Eid. 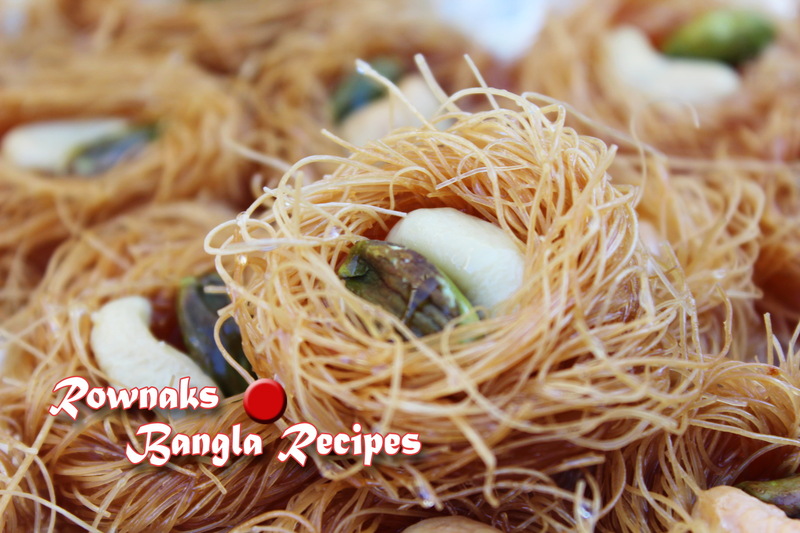 Any kind of Kunafa is made of Kataifi and Kataifi is a very fine vermicelli-like pastry (close to Bangladeshi moist and pliable Semai). I know that Kataifi is not available in Bangladesh. So I thought how to make our Semai (vermicelli) pliable(Because we need to roll Vermicelli to give shape of bird’s nest). So I soaked it for 10 minutes in water which made easy my work J . 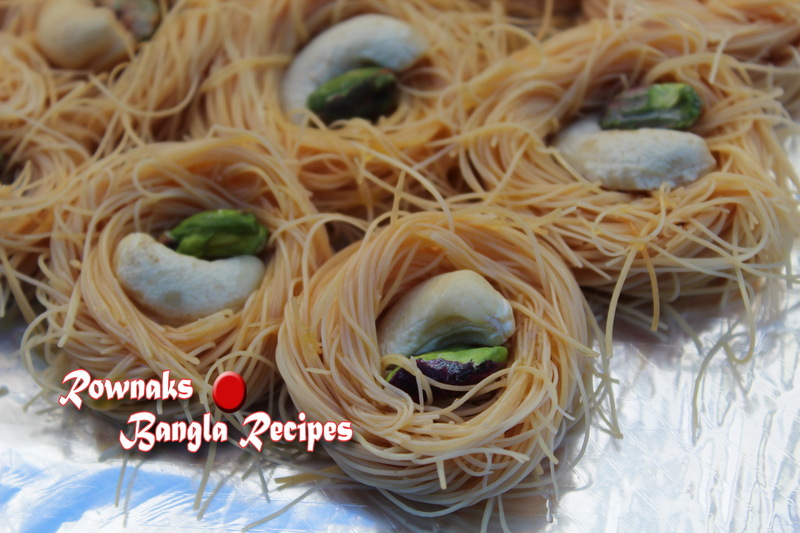 If you have Kataifi, use kataifi otherwise our very own Semai (vermicelli) will do the magic. Grease a tray with clarified butter. If you are using kataifi, brush it with melted butter and start rolling like nest around your fingers. 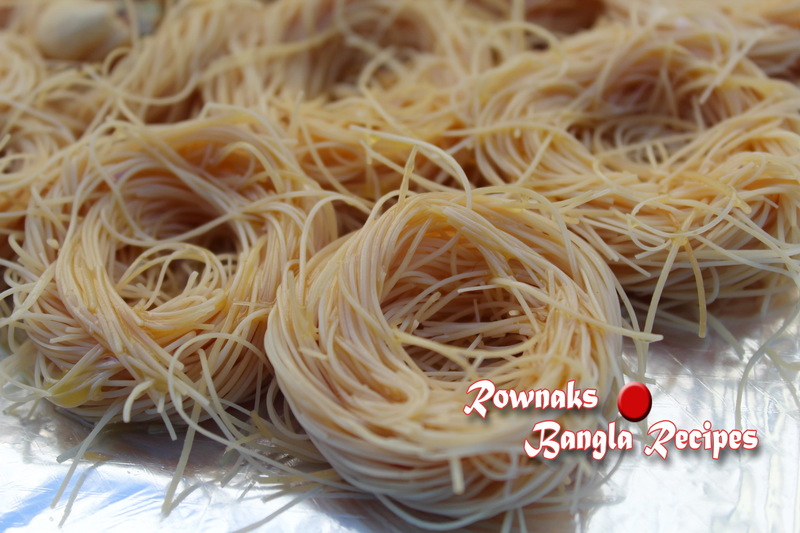 And if you are using Semai (vermicelli), soak it in water for 10 minutes. 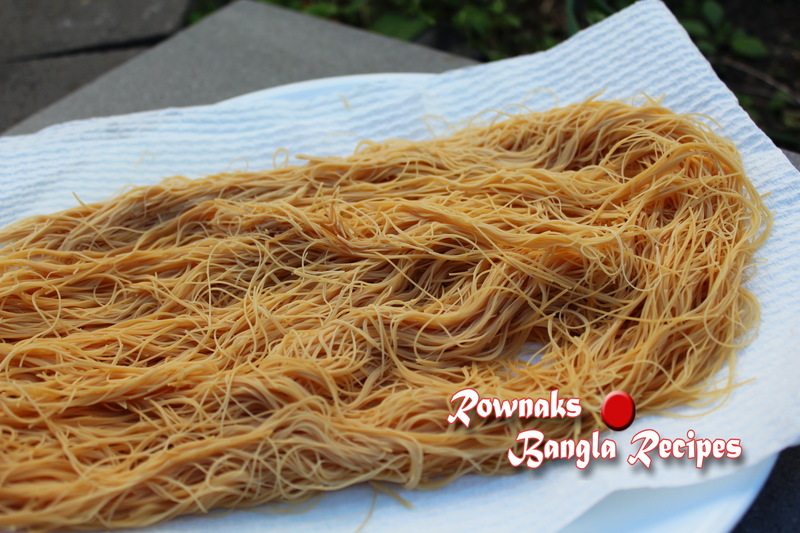 After 10 minutes strain the water and place Semai (vermicelli) over kitchen towel(paper towel) to get rid of any excess water. Now brush it with melted butter and start rolling around your two fingers like a small bird’s nest and arrange them on the greased tray. Repeat the sequence until all of the vermicelli formed into a small bird’s nest. Place nuts to every nest and baked it in the oven in the surface on preheat oven on 160 degree C for about 35 minutes or until it becomes crispy and golden brown. Remove from the oven and sprinkle with syrup and enjoy yummy crispy Bird’s Nest Kunafa.